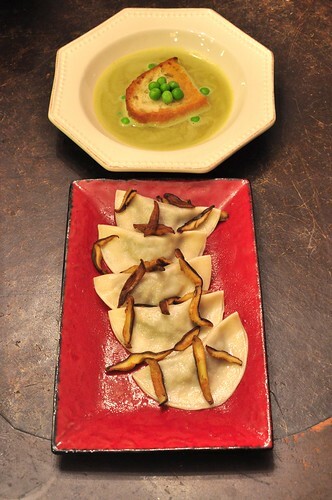 Tonight's dinner features two Jean-Georges Vongerichten recipes that we've made before -- but not together. 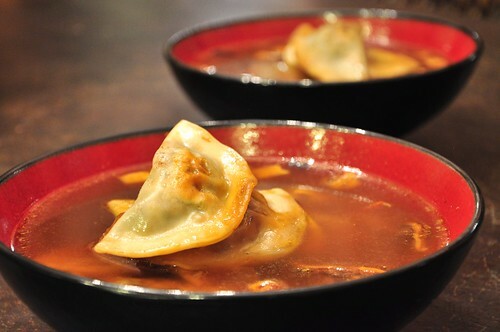 The Asian inspired ravioli uses wonton wrappers as the pasta, and the filling is made from grilled Asian eggplants combined with mint, and finished with a Gewurztraminer sauce. 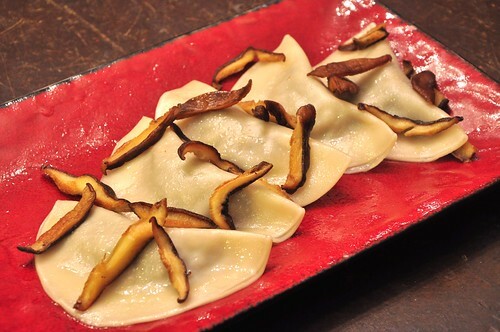 The stir-fried shiitake mushrooms splashed with tamari finish the dish. 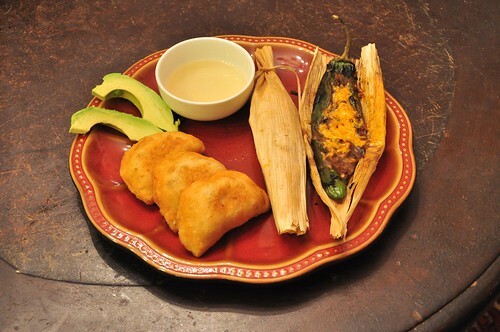 The chiles rellenos were based on a @Rick_Bayless recipe -- Anaheim chiles (roasted, blackened skins removed), stuffed with refried black beans, soyrizo and Daiya, and wrapped in soaked corn husks, which were grilled to finish. The nice thing about these is you can make them ahead of time and stash them in the fridge until it's time to grill them. 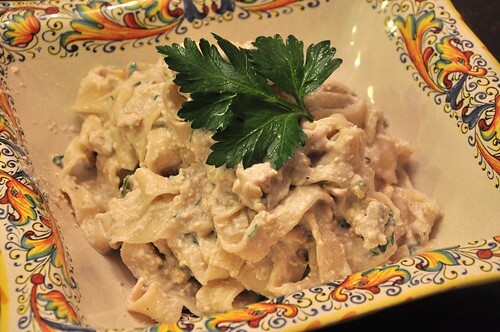 File this dish under "the sum is greater than the parts." 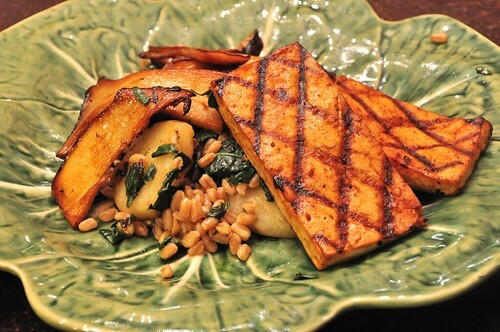 The base was chewy, nutty farro, mixed with silky braised chard, pan-fried King Trumpet mushrooms splashed with tamari and topped with hickory-smoked, marinated (olive oil, tamari, pepper) and grilled tofu. 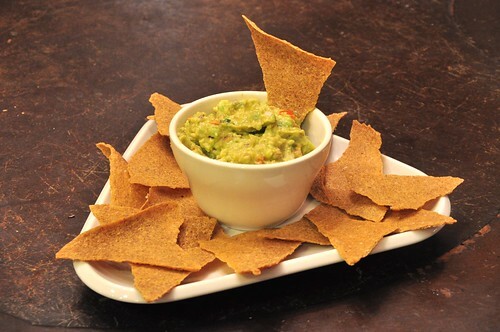 We've made corn chips before but these were the best batch we made so far -- from Matthew Kenney's "Everyday Raw" -- and Liz made a quick guacamole to go along with it. The kids inhaled their portion of the same size. The fajita filling was simply thinly sliced portobello mushrooms, red bell pepper, red onion, jalapeno, garlic, Mexican oregano, olive oil and nama shoyu tossed together and dehydrated for 1 hr. at 105F. The jicama was cut into matchsticks and sprinkled with a little sea salt and provide a nice textural crunch. 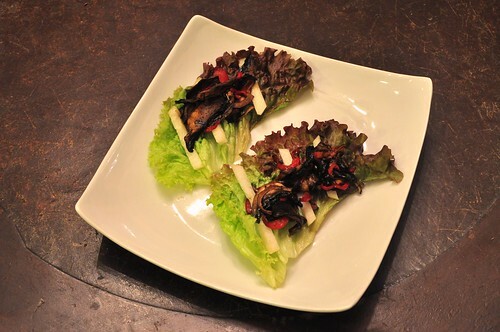 The red leaf lettuce looked like sails on the plate, and were the perfect size to fold in half to eat. 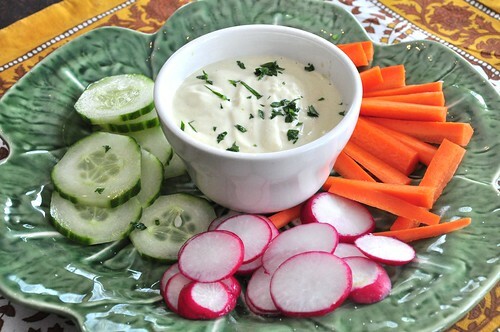 ...and a bonus pic from lunch, No-Bean Hummus from RAWvolution with a crudite platter. 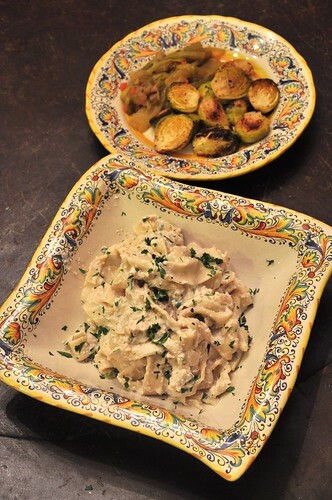 It was paired with a walnut and ricotta sauce (ground/toasted walnuts, ground extra firm tofu, soy sour cream, parsley, salt, pepper and nutritional yeast) which was tossed with the pasta right out of the pot with a little parsley as garnish. 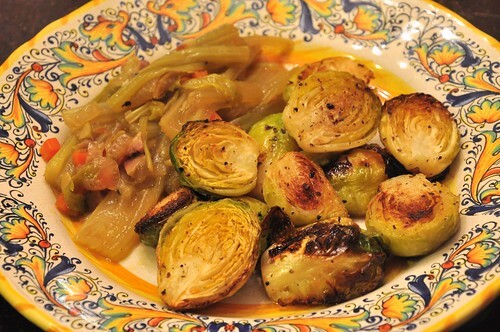 For the sides, we made roasted Brussels Sprouts -- cut in half, tossed with olive oil, salt and pepper and roasted at 450F for 15-17 minutes, tossing about half way through. The other was a Braised Celery dish (also adapted from Lidia), slow cooked in a dutch oven with onion, garlic, tomato paste and a little broth. 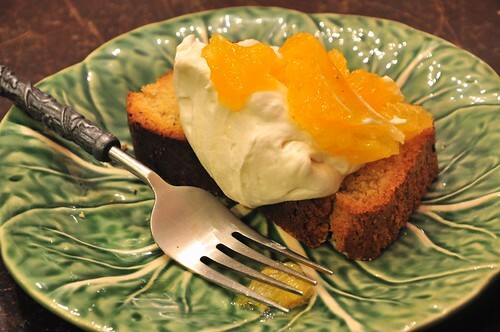 For dessert Liz made a pound cake with a little extra orange juice and as we already had the mixer our for the pasta, a little whipped Soyatoo, topped with orange supremes. 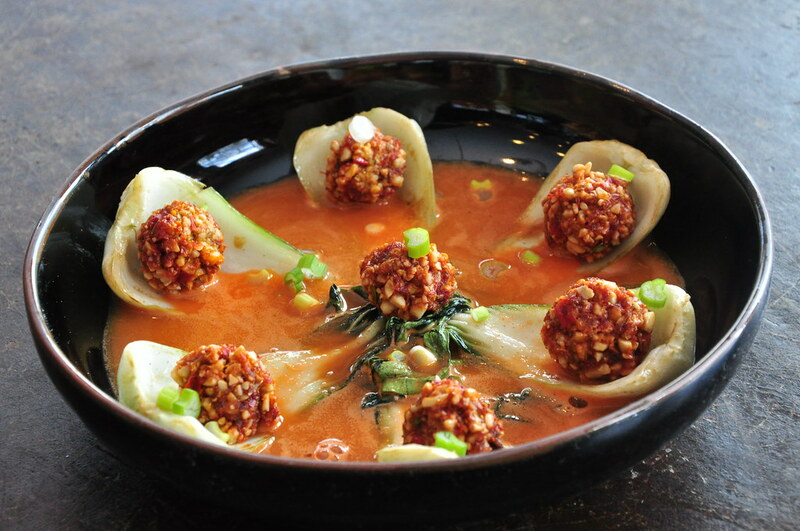 "A raw riff on a Chinese classic, this dish emphasizes the harmony of the bok choy, the earthy flavor of carrots in the broth and the luxurious mouthfeel of the cashew and zucchini meatballs." 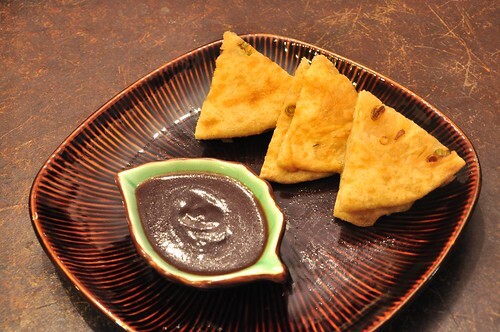 The Scallion Pancakes (recipe) is an easy one, and better yet, freezes & vacuum-seals really well for future meals. 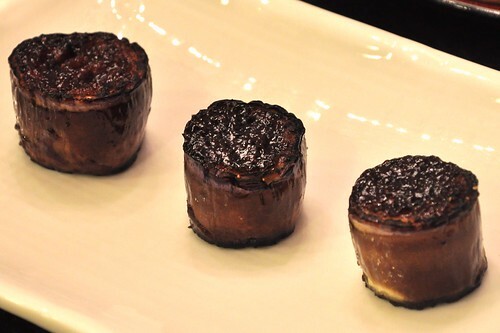 We haven't made the Miso Glazed Eggplant in a while, but here's a quick version of the recipe. Cut the eggplant into 1-inch thick rounds, scored the top/bottom with cross-hatch cuts about 1/4" deep, season with salt and pepper and pan-fry in 1 tbs. of canola oil until browned (about 3-4 minutes per side). 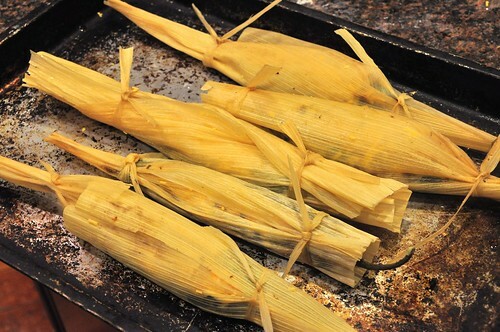 Put on a sheet tray lined with aluminum foil, and bake at 350F for 20 minutes. While that's baking, make the glaze. Mix together 3 oz. sherry, 2 tbs. mirin, 2 tbs. agave, and 1 1/2 tbs. of (red) Miso and reduce by half in a saute pan. 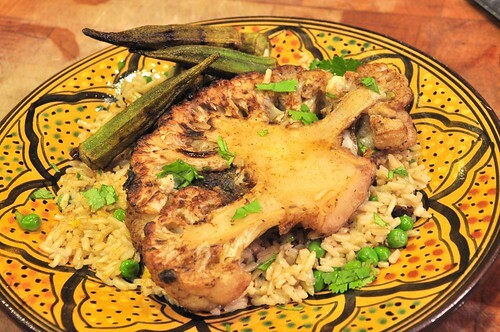 Take the eggplant out of the oven, and brush the top and bottom with the glaze. 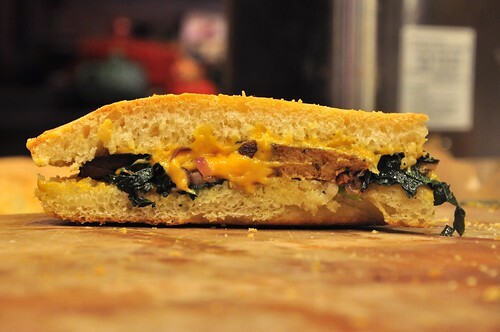 Turn on the broiler and cook the eggplant for roughly 1 minute per side. 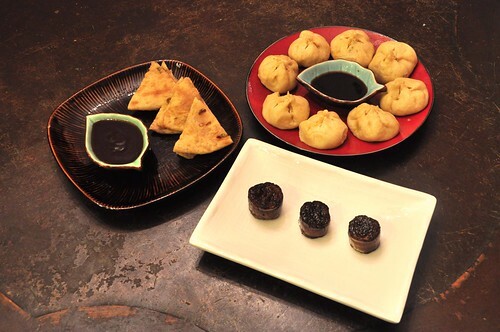 Finally, We broke out the steamer baskets and made steamed vegetable buns (a.k.a. 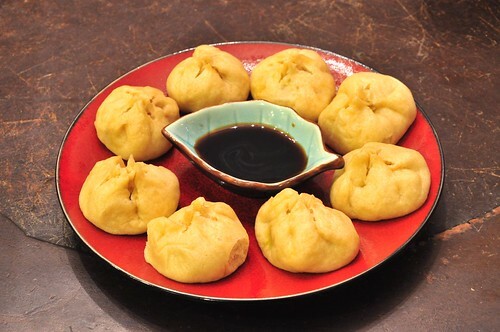 Stir-Fry Buns) filled with carrot, bok choy, red bell pepper, scallion, garlic, ginger and finely chopped tofu. 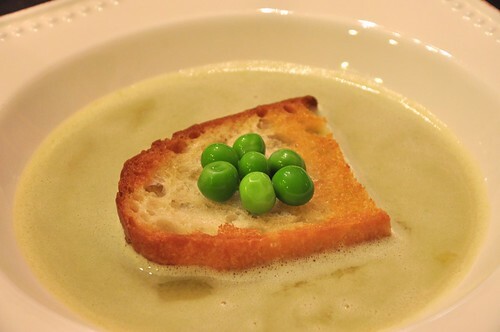 French food on Valentine's Day? Of course mon petit chou-chou! The bourguignon is made from our recipe, which is then put through a large strainer to separate the sauce from the solids. 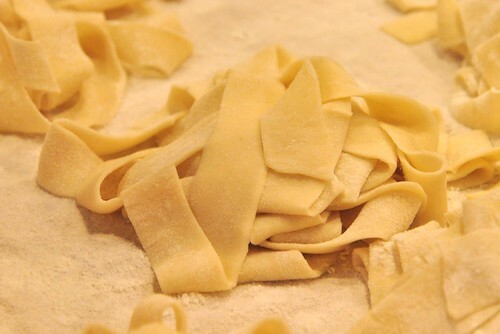 To prepare the phyllo, the mold is brushed with olive oil, and one sheet of phyllo is brushed with olive oil, and is folded into quarters. 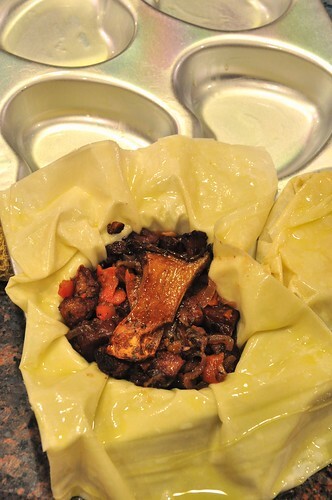 Gently push the phyllo into the edges along the bottom of the mold and spoon the bourguignon on top as shown above. Then bring the flaps of the overhanging phyllo up and over the stew, pressing gently to seal. Bake at 400F for about 10 minutes, remove from the oven and invert onto a wire rack or sheet pan and put back in the oven for another 10 minutes or so, until golden brown. 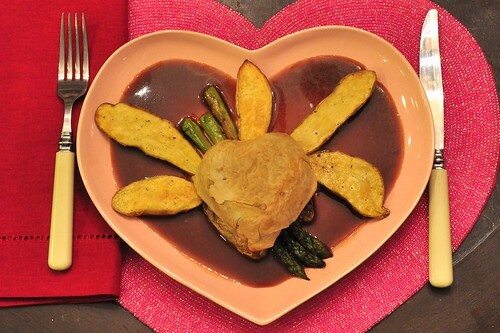 The seitan was plated with two small potatoes placed at a 45°angle, elevating the heart and allowing the grilled asparagus to be placed underneath like Cupid's arrows. The other roasted fingerlings were place outward in sort of a Keith Haring style. Finally, the sauce was poured between the food, fully coating the plate. 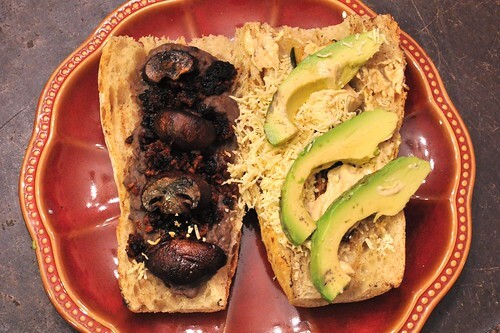 Left side: Black Beans, Soyrizo, Alder-Smoked Pan-Fried Cremini Mushroom. Right Side: Roasted Garlic Vegenaise, Avocado, Daiya. You know what's even better? Dipping the crusty bread of the sandwich into the soup to soften it... not quite a Torta Ahogada, but still excellent. You can blame television for tonight's dinner, specifically Katie Brown's PBS show. 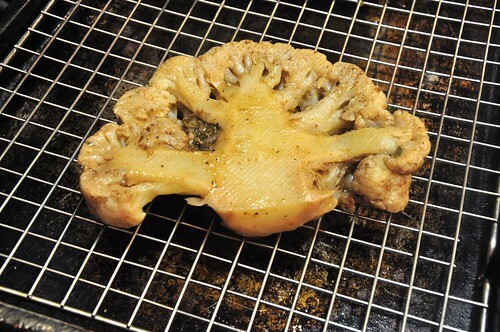 She recently had a show in which she made Cauliflower "Steaks" -- thick cut slabs that were cooked in a large saute pan. It looked really good, admittedly. 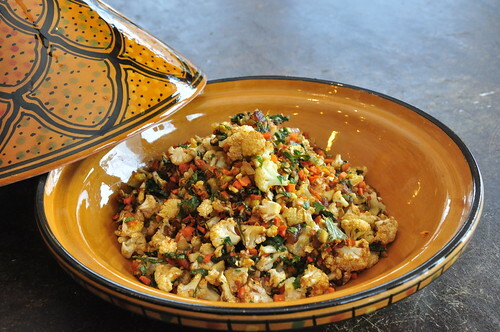 The first step was to cut the cauliflower into 1" thick slices and brush on a marinade of garam masala, crushed chiles, salt, lemon juice and cilantro. 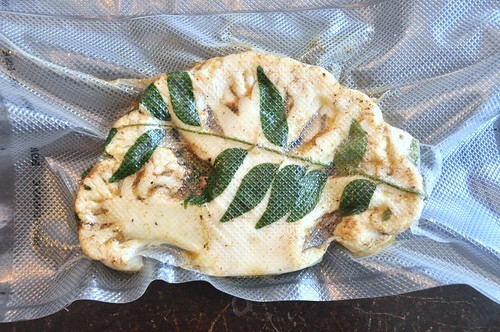 Next, the marinated cauliflower was placed in a sous-vide bag along with a stem of fresh curry leaves, vacuum-sealed and put in the fridge until it was time to cook (about 4 hours). 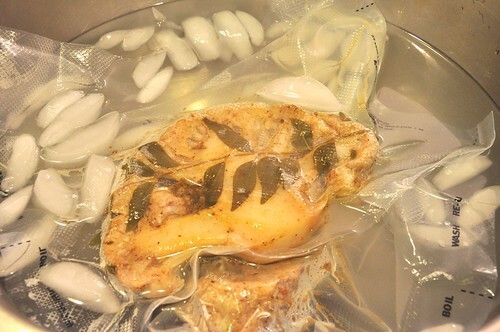 For sous-vide cooking we use our canning pot -- in lieu of an immersion circulator -- the advantages are that it's huge, so you can do multiple items, plus the larger volume allows the water to stay at a stable temp over the course of cooking. 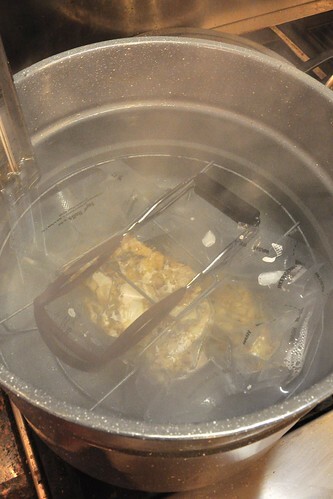 The bags were dropped into the pot of water at 85C (185F) -- the canning tongs were placed on top of the the bags to keep them submerged -- and they were cooked for about an hour and 15 minutes. 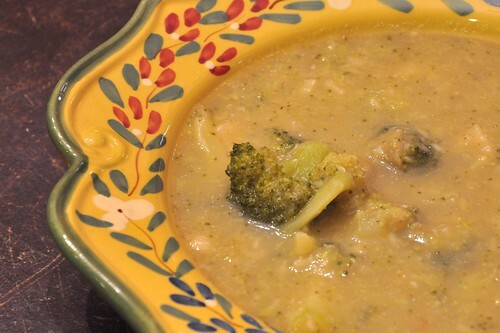 The cauliflower was removed from the pot and immediately dropped into an ice bath for five minutes to stop the cooking. Here they are out of the bag after the ice bath, on the rack about to be finished under the broiler for about 2 minutes a side, just to get a little color. Alternately, you could sear them in a very hot cast-iron pan. So, you're asking, after all that -- how did it come out? 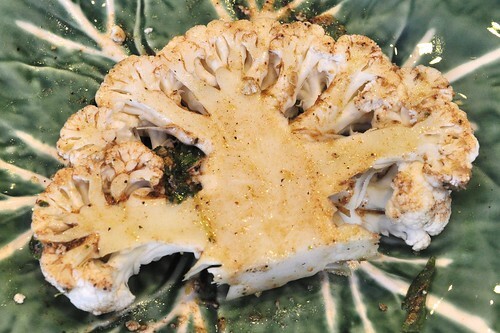 The cauliflower was perfectly cooked, with a melt-in-your-mouth texture (even the stem) that exploded with intense Indian flavors -- it was unlike any Gobi dish we've ever had before. And that my friends, is worth the journey. 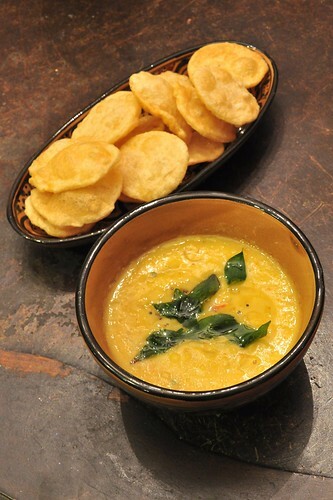 The Toor Dal and Puri combo is always a winner, finished with fried curry leaves and onion seeds. 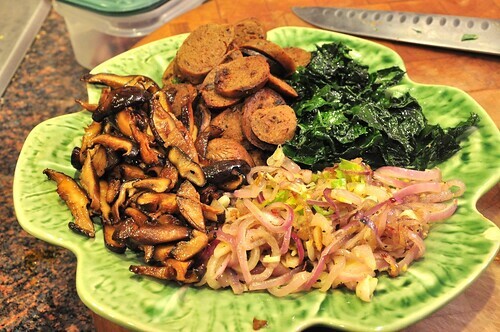 We tweaked our recipe based on what we had this time around -- adding sliced radish greens in place of the kale and diced fennel subbing for the turnips. We went shopping the other day at CAM Asian Supermarket on Miles Rd. in North Randall (across from the abandoned Randall Park Mall) -- and you've already seen the lotus root chips, long beans and King Trumpet mushrooms from that trip. We also picked up Vietnamese spinach (a.k.a. Mồng tơi, which has a very earthy taste), fresh water chestnuts (which are so much better than the canned versions it's not even funny) and fermented black beans -- all of which ended up in the dumplings. 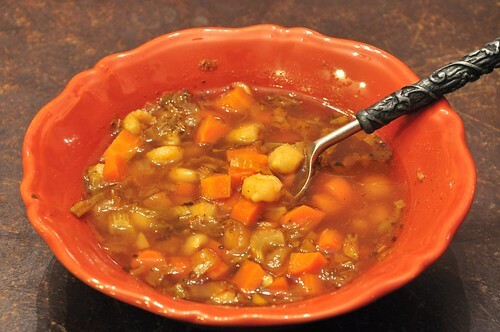 The Hot and Sour Soup is from Veganomicon, with the addition of stir-fried tofu, carrot, red bell pepper and shiitake mushrooms. 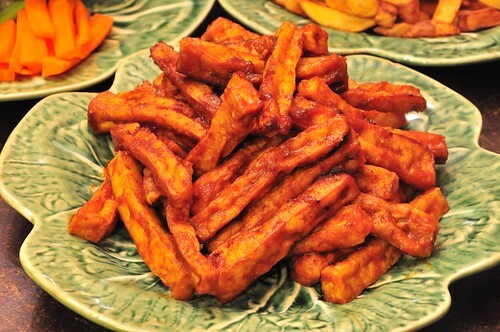 The tofu was cut into strips, hickory-smoked for 25 minutes, then deep-fried at 375F until golden brown (about 4-5 minutes per batch). The tofu was then tossed in a wok with 2 tbs. of tamari for 2 minutes, and then the sauce is dumped on top and tossed to coat. 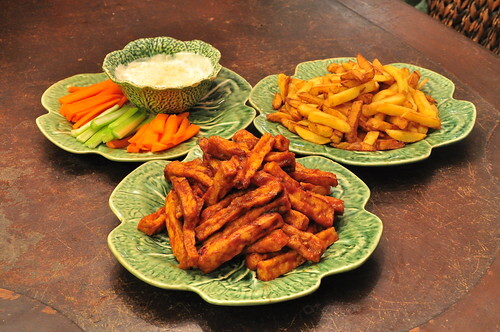 The buffalo tofu sauce is our BBQ sauce mixed with as much Sriracha as you like and 2 tbs. of melted soy margarine. We fry the pommes frites in our wok, with a heavy duty candy thermometer for accurate temperature readings. 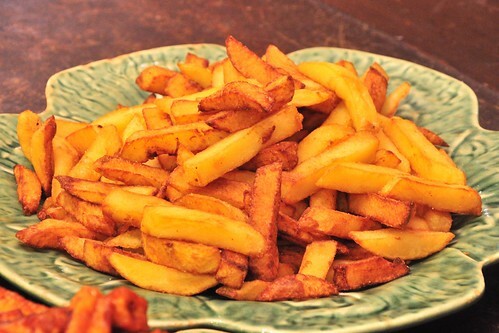 The pommes frites were done the standard way: the potatoes were blanched in peanut oil at 280F for 6-8 minutes, then removed from the oil and allowed to "rest" for 15 minutes. To finish, they're deep-fried at 375F for 2-3 minutes to brown/crisp up. 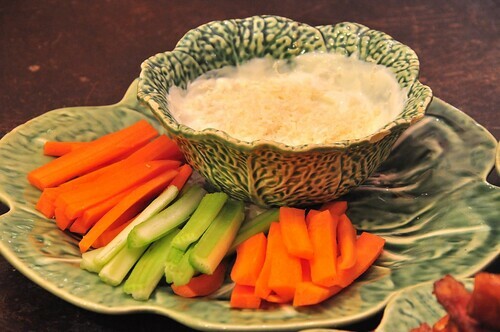 Celery & Carrot sticks served with a dipping sauce of half vegenaise, half soy sour cream, roasted garlic topped with a small mountain of microplaned Blue Sheese. Start with a 1 tbs. of canola oil and saute 2 tbs. minced shallot, 1 tbs. ginger, 1 thai bird chile (remove the seeds for a less hot version) and as much garlic as you can humanly handle. We've been known to use an entire small head. After a minute or so, add 1/4 cup of thinly sliced thai basil (or more if you like it that way). Stir until wilted. Add a cup of water, 2 tbs. of tamari, 1 tbs. agave and 2 tsp. freshly squeezed lime juice and bring it all to a simmer and let the flavors develop for 5 minutes. In a small cup or bowl, mix 1 tbs. cornstarch with an equal amount of water, whisk to combine, and whisk into the sauce, until it thickens. 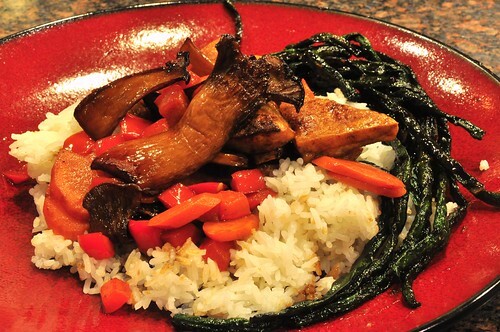 Serve hot over your stir-fried veggies and tofu. 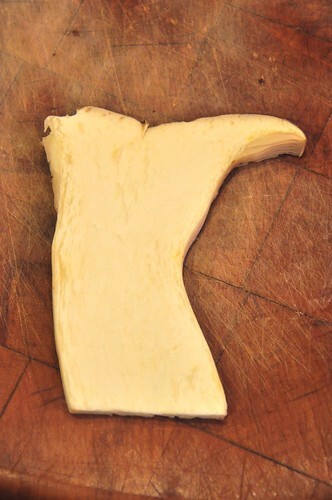 King Trumpet Mushroom or State of Minnesota? You Decide. We came across this one while watching "Lidia's Italy" on PBS and sort of reverse engineered it. 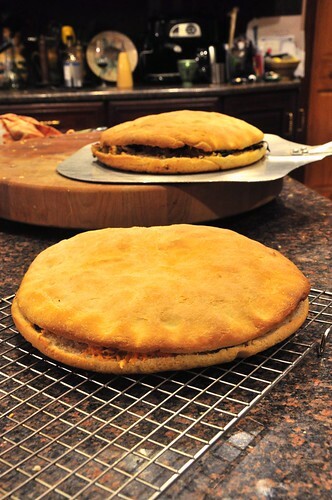 Just use your favorite pizza dough recipe with enough dough to fill 2 12-inch cast-iron skillets. 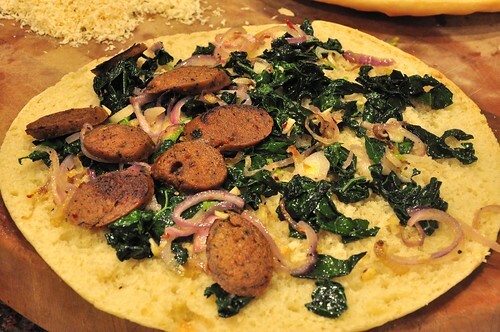 ...and add the filling: shiitake mushrooms, soy sausages, red onion, chiles, dinosaur kale and Daiya. Spread the filling on the bottom half of the torta, put the top half back on and bake in the oven until the Dayia melts. We made the taco salad again, slightly changing a couple of things around. 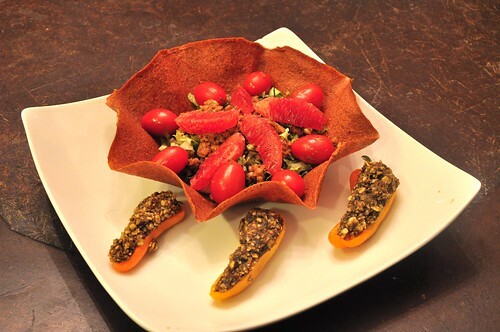 The shells used fresh and sun-dried tomatoes in place of the red bell peppers, and the filling included supremed blood oranges pieces as well as using the juice for the salad dressing base -- 1 tsp. blood orange juice, pinch of salt, with 1 tbs. olive oil whisked together until emulsified. Liz made the stuffed mini-pepper with a pine nut and hemp seed filling which made for a nice one-bite appetizer. Put the flax seeds in a spice grinder and process, then add to the vita-mix along with the water and let sit for 15 minutes. Put the tomatoes and the rest of the ingredients into the Vita-Mix and process on high until smooth. 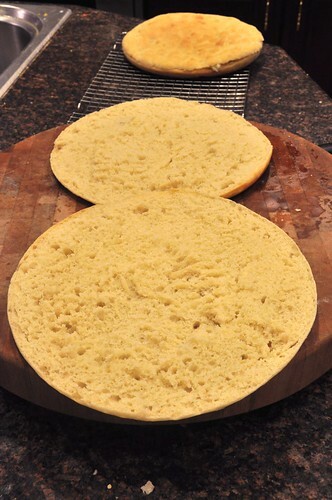 Spread out the mixture into 10" rounds with an offset spatula and dehydrate around an hour on 105F. Carefully flip the tortillas and dehydrate for an additional 30-40 minutes or so. Take a peak at this point to make sure they're not too dry -- you want them flexible enough so you can mold them later. 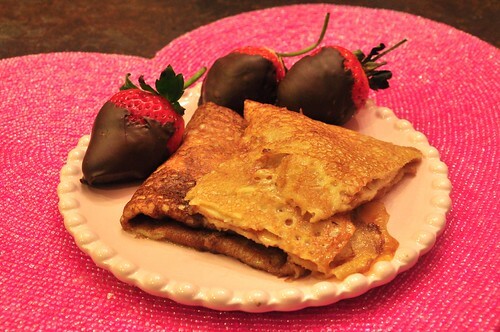 You can make these a day in advance and store in the fridge if needed. 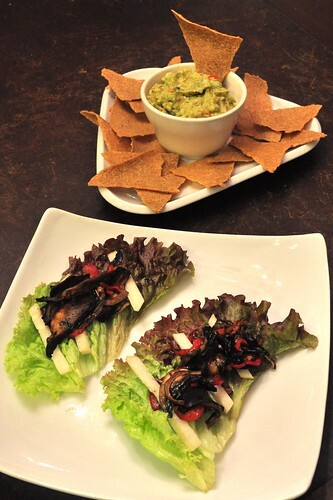 Place the tortillas inside the taco shell mold and dehydrate for 2 hours which will set the shape. Gently remove the tortilla from the mold, flip the mold over, and drape the tortilla over the inverted mold and dehydrate for another 2 hours. 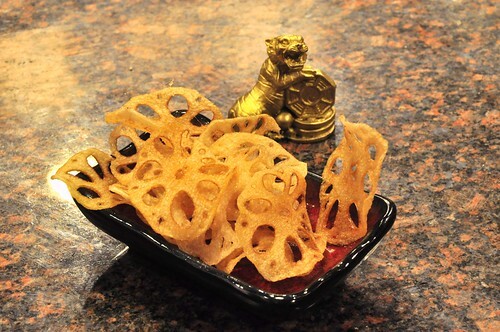 This allows the other side and base to dry evenly, as well making for a crispy bowl. 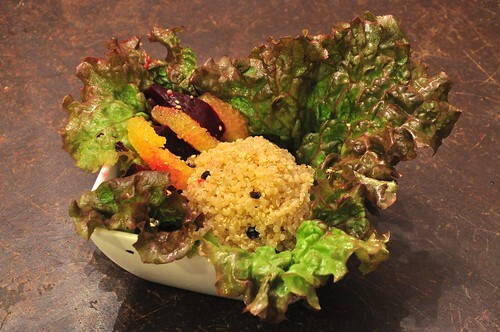 A recipe for Isa's next book consisting of quinoa, currants, orange sumpremes, roasted beets and toasted sesame seeds on a bed of red leaf lettuce.